August 22, 2018: The dog ate my truth. I wonder if that ms. was inspiration for "Bubba Hotep". The Ossie Davis character, I mean: President John Kennedy. Yeah, I want that book. If you are a man of leisure, are you wearing a leisure suit? I'd pay a dollar to see that. 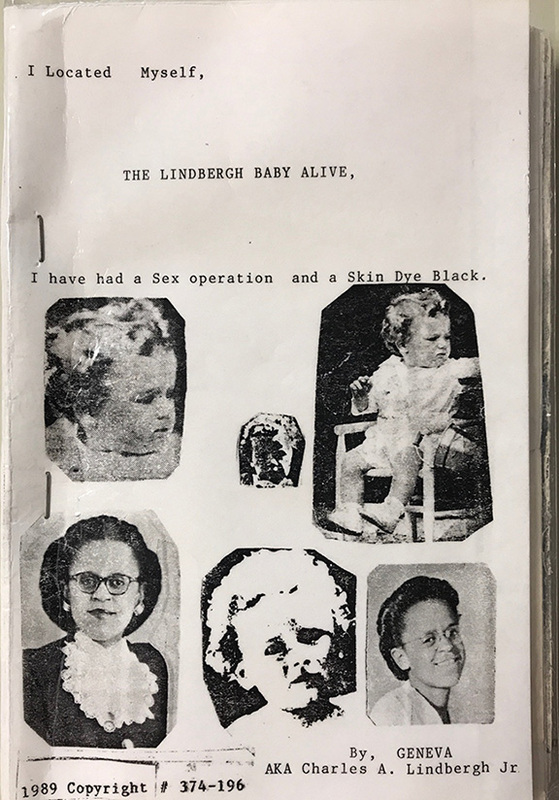 The Lindbergh baby incident was a real tragedy. It is a shame to see somebody exploiting it for a cheap byline in the NY Post. This kind of "Art" really bugs me. I think I know something about art, I dropped out of Syracuse University Art School for a BFA (I sold ten paintings for $50 bucks each), dropped out of Cooper Union for Architecture (after 3 years) and lived in Manhattan for a couple years and went to about a dozen art gallery openings. So I am no expert, but I do know something. Phew. This Matt Wilson is pretty good! Reminds me of the jazz in the Dirty Harry movies, or in the TV show Bosch. Irwin, your Jazz selections are more enjoyable than a local Jazz station out of Toronto that is "one of the best in the world". Your show is FAR more listenable. I like the way the organ sounds like its coming in on a shortwave set. King Crimson covered Donovan! Get Thy Bearings. I LIKE Donovan a LOT. I think it would be cool if King Crimson played it and Donovan SANG it. How cool would THAT be? That is the REAL 60's to me, just like The Monkees Headquarters album. wow Little big league sounds like carol from Bettie Serveert. Really good. What little Danny said. Little Big League is a bit like Mudhoney if Mark Arm was a girl. A bit like L7 also or maybe The Breeders? I should clarify the delusional art of a damaged mind. Lots of damaged minds create great art. I feel like its 1997 listening to this femme noise pop. Hello on this side, Deb! Yep, probably in the next set. Just played her earlier band, Little Big League. Ken played Pip Blom this morning. I thought this was Lust For Clarksville but apparently I was mistaken. You know who covered Donovan and took up an whole lp side to do it at their career peak? Any particular Japanese Breakfast releases to recommend? LD: There's only two albums, both stellar: Psychopomp and Sounds from a Soft Planet (IIRC). Flash: That is the CORRECT answer! Great to hear Calypso again. I miss Muriel's treasure, a great former WFMU show. This Kings tune could be the dumbest song I like. I feel like I've heard this Kings tune a thousand times and never. F'ricks: It's one of those songs about guys who rock that rocks. They go all night. Rock, that is. I was starting to get that vibe, Irwin. hello there, irwin and fellow listeners. my ding dong is not hanging down, btw. What is it doing, Monica? thanks for the Kinga! that took me way back. Song supposedly about Dylan, but what do I know? Gerry Conway on drums, great patterns. nice song. always some great stuff heard on this show. Why do I know the intro to this so well? TfF knew how to use percussion. Brilliant rhythm patterns. clicky star for this episode! Thanks Irwin! Happy birthday, Roland Orzabal from Tears for Fears.